The unusually shaped building in the following photographs is a former woolstore and is now an apartment and retail complex. I live right across the road from this building. The photographs above are not dated, but I would estimate that they were taken ten to fifteen years ago. The foreground of the bottom picture was a garden shop and nursery in that photo, and now contains a new three-storey apartment block, offices and a restaurant. Originally the Dalgety Woolstore No 3, the building in our photos then became the Queensland Primary Producers Woolstore No 8, whose sign is still on the fascia at the front. The sign was repainted recently, proudly adopting the state's colours. After its life as a wool store was over, the building was sectioned off into retail space and became known as Paddy's Markets, a popular place for Brisbane shoppers to locate all sorts of bric-a-brac. If we go further back in time, there was a brewery on this site. It was operated by Queensland Brewery, later taken over by Carlton United, and it produced Bulimba Beer. The brewery functioned here between 1883 and 1906 when the land was sold to Dalgety, who started the woolstore presence in the area. They built a couple of warehouses on the site, which then faced a number of wharves on the river, and a railway line ran along this street to facilitate the transport of bales of wool. Those buildings were demolished in 1955 to allow a street to be extended through the property. 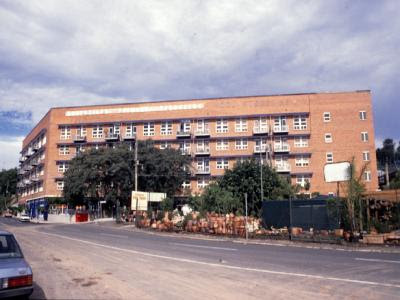 It was then (1955-7) that the present structure was erected. 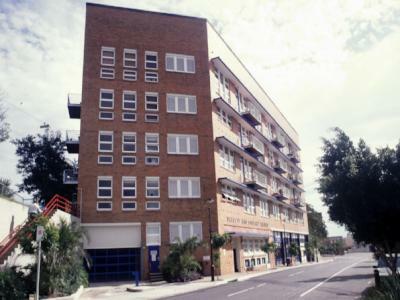 The building now contains residential apartments with retail tenants on the ground floor. Everything from a convenience store to a hairdresser to a recruitment office, a bar, a bottle shop and four (count them, four!) restaurants are present to satisfy the requirements of this medium density residential area. I remember this being Paddy's markets. In fact, I bought my wedding dress material there so it must have been refurbished sometime in the last 17 years. They had the scariest old lift system to get between floors, otherwise you had to walk the cramped staircase. Oh the memories! The area has a long history, but is now in the throes of gentrification.